Workwear Express is a leading supplier of printed clothing and workwear throughout the UK. 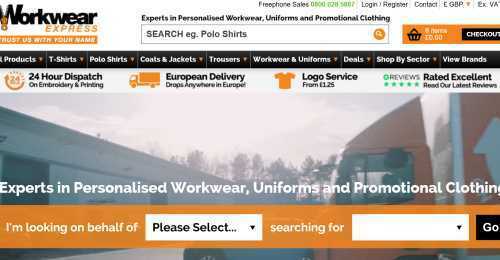 Workwear Express offers a wide range of workwear and clothing which is sold either customised or plain. The product range includes aprons / tabards, bags, bodywarmers, fleeces, flame retardant clothing, footwear, headwear, hi-vis clothing, hoodies, kids clothing, knitwear, jackets, overalls, PPE, polo shirts, softshell clothing, sports / teamwear, shirts / blouses, suits, sweatshirts, t-shirts, trousers, tunics and woman's workwear. Workwear Express deals with top brands such as; Dickies, Mascot, Fruit of the Loom, Dr. Martens, Caterpillar and many more. Deals from Workwear Express - Up to 40% off! Have a closer look at all the bundle deals at Workwear Express and save up to 40%. Each bundle comes with a free logo in the form of an embroidered logo or one colour print as well as free delivery to anywhere in the mainland UK. Verified two days ago. Valid until further notice. Workwear Express discount code not required. Verified today. Valid until further notice. Workwear Express discount code not required.